See Alex Kapranos's latest look and watch the band perform their Take Me Out anthem. 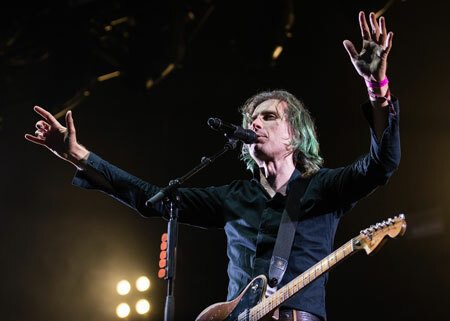 Franz Ferdinand played an epic set at Kendal Calling last night (27 July), but if you hadn't seen the band in a while, you may have got a bit of a shock. Frontman Alex Kapranos was sporting a look very different from the band's early days, swapping his tidy short back and sides to a long salt and pepper style. The Scottish rockers treated fans to a career spanning set, including their 2004 hit single, Take Me Out.